Creed crusher, or, spiritual mill for pulverizing creed &c., : God dwelleth not in temples made with hands, Acts 17 c. 24 v.
This map isn't part of any series, but we have other religious maps that you might want to check out. 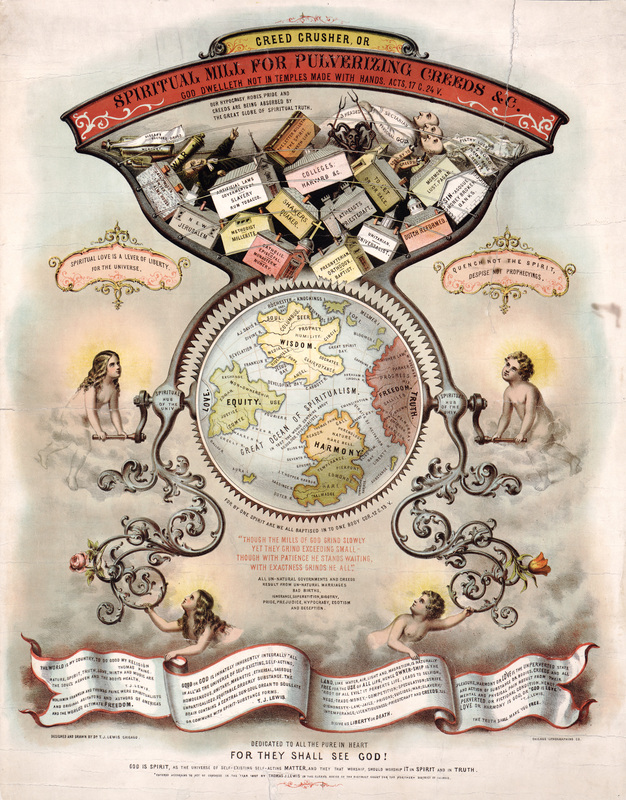 Lewis' "Creed Crusher; a Spiritual Mill for Pulverizing Creeds"
This amazing piece of art has only a very thin cartographic connection (the fictive globe at the center with continents representing virtues such as "Truth", "Harmony", "Wisdom", etc.). 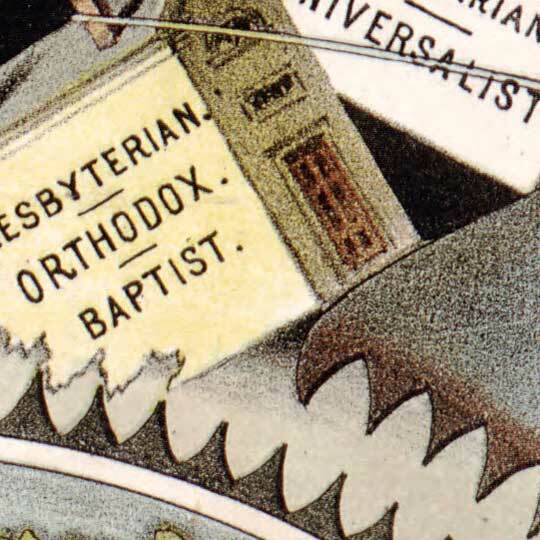 I'm far from an expert on Christian religious movements of the 19th Century... but I am capable of discerning a message if the symbology is painted on thickly enough, or has an unambiguous title. It's my good luck that this beautifully illustrated piece has both of these things. I think he's advocating doing away with various sects from within Christendom, yeah? But as far as answering the questions of "for what purpose", or "in which tradition", I'm afraid I'll have to poll the expertises of my readership, who have always pleasantly surprised me with the quality of their insight into their varied specialties. Edit: a very illuminating discussion about this map can be found in this MetaFilter thread. Any reader wanting more information about the things mentioned in this print would do well to check it out; the analysis is pretty thorough. Thanks, MeFi.